Can you get addicted to sugar? Do you need to quit it cold turkey? Here are expert answers. Recently, talk show host Ellen DeGeneres declared that she was going on a sugar cleanse, purging her diet of all refined sugars to boost her well-being. While naturally occurring sugars, such as the kind found in sugar snap peas, were still OK to eat, no one was going to catch Ellen letting a Bundt cake cross her lips. Her sugar cleanse diet inspired many viewers to embark on their own sugar smackdowns. Is this the latest food fad, or are the sugar naysayers on to something? We don't need to go cold turkey on sugar, health experts tell WebMD. But most of us would do well to lighten up on the sweet stuff. A coworker with an unshakable candy bar habit might sigh that she's utterly addicted to sweets. Can someone truly become physically dependent on sugar? Sugar taps into a powerful human preference for sweet taste, says Marcia Pelchat, PhD, a scientist at the Monell Chemical Senses Center, a basic research institute in Philadelphia. "We're born to like sugar," she says. "Sugar does seem to be special in some ways," Pelchat says, even in the womb. Doctors used to treat the problem of excessive amniotic fluid by injecting a sweet substance into the liquid, she says. The appealing taste would prompt the fetus to swallow more fluid, which was then flushed out through the umbilical cord and the mother's kidneys. Not only do infants prefer sweet tastes, but when babies drink a sweet solution, it can ease pain through a natural analgesic effect in the body, Pelchat says. Way back, the preference for sugar may have conferred an evolutionary advantage by leading people to seek out ripe fruits, which are sweet and serve as a good source of calories, she says. But nowadays, is the coworker's constant hankering for sugar merely a strong liking or is it a true addiction, with physical dependence and withdrawal symptoms? "The jury's still out," Pelchat says. Scientists aren't sure if people can become physically dependent on sugar, although some animal studies suggest that such a thing is possible, she says. "There are the same kinds of changes in brain dopamine, in these animals given intermittent access to sugar, as in drug addicts." Unlike with substance abuse, people don't get the shakes when they stop eating sugar. But people with constant sugar cravings do exhibit one symptom of dependence, Pelchat says: "continued use despite knowledge of bad consequences or having to give up certain activities." For instance, people who crave sugary, fatty foods will keep eating them even if obesity makes it uncomfortable to walk or to sit in an economy seat on the plane. Researchers have found a link between sugar and unhealthy levels of blood fats. “There’s an association between added sugar intake and what we call dyslipidemia -- higher triglycerides and lower HDL ("good") cholesterol, says Rachel K. Johnson, RD, MPH, PhD, a professor of nutrition at the University of Vermont and a spokeswoman for the American Heart Association (AHA). In a study published in the Journal of the American Medical Association (JAMA), people who ate the largest amounts of added sugar had the highest blood triglyceride levels and the lowest HDL (good) cholesterol levels. That study also showed that eating lots of sugar more than tripled the odds of having low HDL cholesterol levels, a strong risk factor for heart disease. In contrast, people who ate the least sugar had the lowest triglyceride levels and highest HDL levels, a protective factor against heart disease. But "the study doesn’t prove that added sugars cause dyslipidemia,” says Johnson, who wasn't involved in the JAMA study. Johnson says that to prove that sugar causes problems with blood fats, scientists would have to conduct a clinical trial in which some people ate a diet high in added sugar and others ate a diet low in added sugar. Then researchers would track their triglyceride and cholesterol levels. Such a study would be expensive and hard to carry out, she says. However, Johnson points out that weight did not explain the JAMA findings. “Obesity is obviously related to dyslipidemia, but based on the JAMA paper, the added sugars had an independent effect, separate and distinct from the added sugars’ impact on weight," she says. "Eating sugar per se does not cause diabetes," Johnson says. But large, epidemiological research has shown an association between intake of sugar-sweetened beverages and diabetes, she says. The real culprit may be obesity. "It may be because the sugar-sweetened beverages are associated with higher BMIs or associated with overweight and obesity, which we know is a risk factor for diabetes," Johnson says. 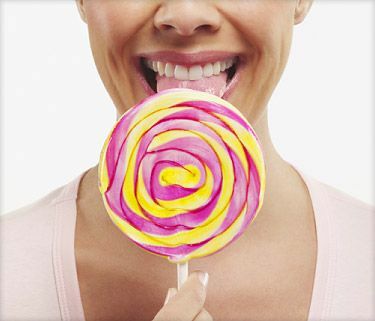 Is sugar affecting children's health? Pediatricians are concerned that too much sugar is in their young patients' diets, Kavey says. But again, sugar by itself is not the problem, she says, but rather the excess pounds. "The reason that we think of it as a problem is because of the big rise in obesity in childhood, and that rise has occurred over the same time period that there's been a major increase in the amount of simple sugar that children consume," Kavey says. Juices, sodas, sweetened cereals, cookies, and candy are common sources of sugar in children's diets. But other factors -- like spending a lot of sedentary time with computers rather than running around and playing -- may also contribute to childhood obesity. What about the notion that sugar makes some children hyperactive? "In my own experience, I know there are some children who are very sensitive to sugar. They really are quite wild after they have sugar," Kavey says. "But that's not proof. The literature on it is not conclusive at all." Are some types of sugar better than others? Celebrities and high-profile chefs have touted the benefits of replacing refined white sugar with purportedly more natural, healthier sugars, such as honey, maple syrup, or molasses. But there's no truth to these common misconceptions, Johnson says. "In terms of something being inherently better about those sweeteners as opposed to table sugar or sucrose -- no." The bottom line: All are simple sugars. "A calorie of sugar is a calorie of sugar, so whether you're getting it from white sugar or some other type of sweetener, you're still adding empty calories to your diet," Johnson says. However, there may be one redeeming quality, she says. "Some of those sweeteners -- like maple syrup, molasses, honey -- may have a stronger taste, so you might be able to get the sweetness that you want with less of it, using less calories." What about substituting artificial sweeteners? Despite public worries that they might cause cancer, "They've been approved as safe by the FDA and I think that they can be a good tool to lower the calories in your diet," Johnson says. "But you need to be careful that it's about the total calories. You always hear about the person who puts the non-nutritive sweetener in their coffee and then has a piece of cheesecake." How much sugar does the average American eat? Sugar shows up naturally in lots of foods, but those aren't the types of sugars in the spotlight. Instead, it's the sugar in the doughnuts and sodas or even in the maple syrup that we drizzle onto our pancakes. "We do know that Americans are consuming way too much added sugars," Johnson says. "These are the sugars that are added to foods in processing or preparation. They're not the naturally occurring sugars, like fructose in fruit or lactose in milk or dairy products." Johnson led the team of experts that wrote the AHA's 2009 scientific statement on added sugars and cardiovascular health. The report pointed to sodas and other sugar-sweetened drinks as the main source of added sugars in Americans' diets. From 2001 to 2004, the report noted, Americans consumed lots of sugar: an average of 22 teaspoons a day, the equivalent of 355 calories. Eating too much sugar can create two main problems, Johnson says. "It either adds calories to your diet or it displaces other nutritious foods. Most Americans could benefit from reducing the amount of added sugars in their diet." However, none of the experts who spoke to WebMD advocated that people try to purge all added sugars from their diets. By itself, sugar is not a risky food, says Rae-Ellen W. Kavey, MD, MPH, a pediatrics professor at the University of Rochester School of Medicine and Dentistry. "The focus should be on a healthful approach," she says, "not people rushing to one side or the other." Moderation is key, experts say. For example, the AHA statement recommends that women limit themselves to about 6 teaspoons of sugar a day, or about 100 calories. Men should aim for about 9 teaspoons a day, or 150 calories. Just how much sugar is that? A 12-oz. can of regular soda contains eight teaspoons of sugar, or about 130 calories. Rachel K. Johnson, RD, MPH, PhD, professor of nutrition, University of Vermont; spokeswoman, American Heart Association. Rae-Ellen W. Kavey, MD, MPH, professor of pediatrics, University of Rochester School of Medicine and Dentistry. Marcia Pelchat, PhD, scientist, Monell Chemical Senses Center. Johnson, R. Circulation, Aug. 24, 2009; vol 120; pp 1011-1020.